sweat like becky: Finley Gets Her Braces Off!! It has been 6 months, 1 week and 4 days since Finley got her braces on and yesterday she got them off. 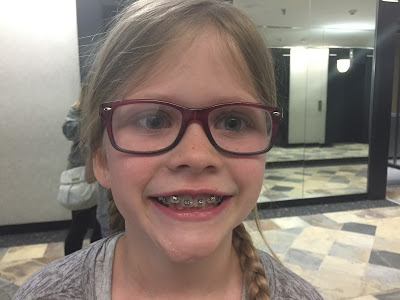 When she was first told that she would be getting braces, she was sad that her teeth weren't going to be pushed up anymore because she thought that they made her unique. 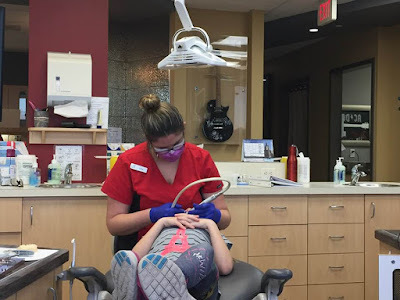 6 months later and she is again feeling sad - but this time she is sad that she is getting the braces off. This was Finley the morning of May 16, 2017 before we left to get her braces on. This was Finley right after she got her braces on just before we boarded the elevator. 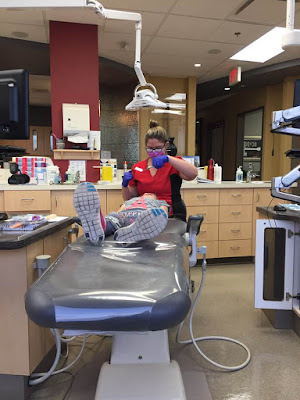 She has been back to the orthodontist every 6 weeks since May. Each time they take the wire off and give the teeth a good clean. They also make sure that her teeth are moving where they are supposed to be. Then they replace the wire and we go on our way. At one of our appointments, I don't remember which one, they put on a thicker wire for her. She never noticed a difference between the thickness of wires. 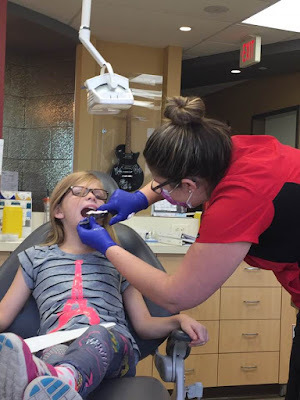 Last week, we went in for her final check up before getting her braces off yesterday. Dr H just wanted to make sure the teeth were where they were supposed to be and ready to have the braces removed. They also took a cold of her mouth for her wire to be made. 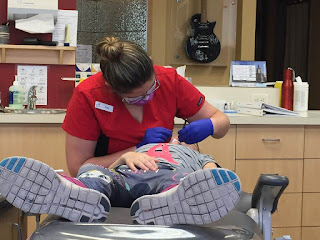 We had an early morning appointment at Finley's request and Dr H came and did another last minute check to make sure her teeth were good to go. 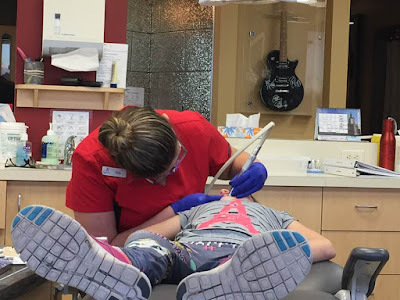 This was when she removed her last bracket from Finley's mouth. It was a very exciting moment. Next up was the wire that goes behind the back of Finley's teeth so that her teeth don't shift back. At this point though, she was getting her mouth ready and make sure the back of her teeth were clean and dry. Once that was done, they applied glue back there. She then stuck foam, or something similar to foam, into her mouth to keep it open while the wire was being attached. I have no idea how long she has to wear it but I just tell her it is forever. This changes the way she has to floss and it's gonna be a struggle for both of us until we get it under control. Once the glue was dry and the wire wasn't gonna go anywhere, they started the process of getting all of the glue off of her front teeth. This was probably one of the longest parts of the process. 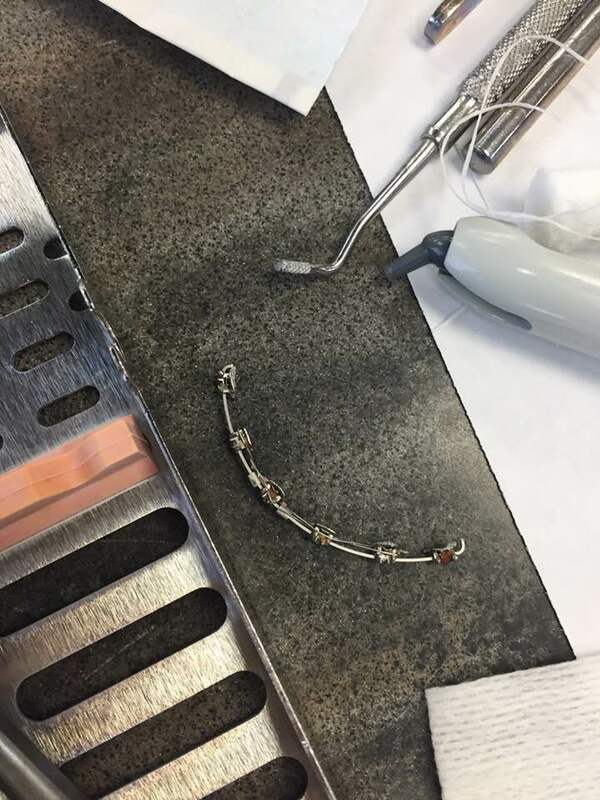 Then they had to do another mold of her teeth with the braces off and the wire in place so that they could a retainer made for her to wear. This takes like 30 seconds to do. She then got to pick out what color she wanted for her retainer and to nobody's surprise, she chose rainbow sparkle. The bracket that was in Finley's mouth. You can see chunks of food in it which did not make me happy haha. It looked far larger on the table then it did when it was in her mouth. And before we could leave, she had a photo shoot where they took photos of her mouth in every possible position and angle. She felt really cool to be having a photoshoot haha. Finally a smile with her braces off. I can't believe how much different and older she looks with her braces off. 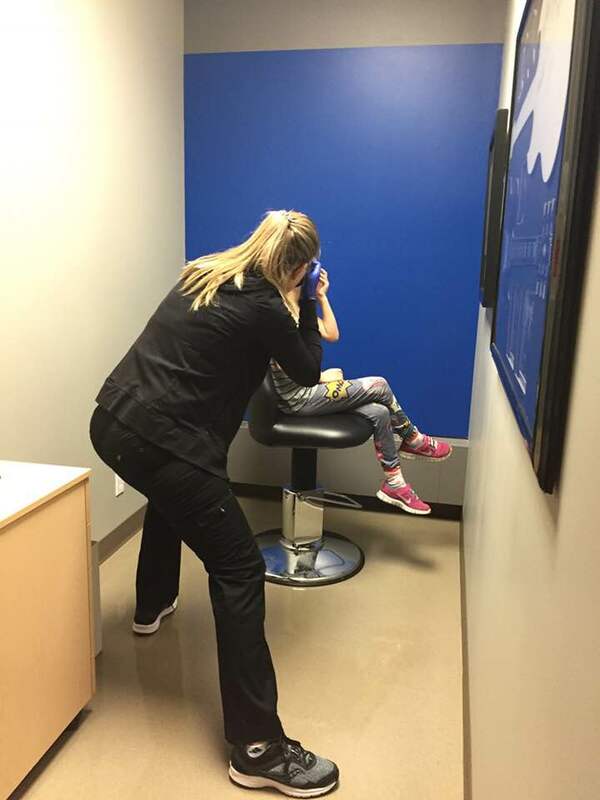 She has been obsessively checking herself in a mirror and is beyond happy when people notice her braces being gone. 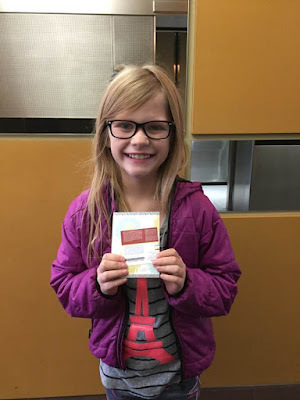 They gave her a congratulations card for being finished and a gift certificate for a movie and snack at Landmark Cinemas. What a super nice thing to do. After school, we headed back to the orthodontist office so we could pick up Finley's retainer. She picked the sparkliest retainer and case she could find in true Finley fashion haha. 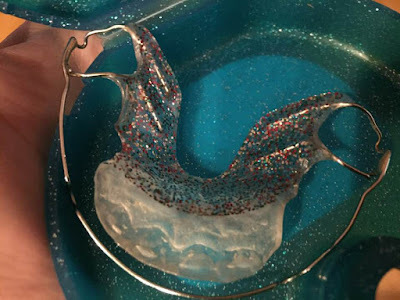 She has to wear the retainer a few hours at home after school and every night to bed. It took awhile to get it to fit right in her mouth and to make room for her 2 teeth that are incoming. She is to brush it before and after use and never ever wrap it in a paper towel because that is how they got lost and thrown out. So our 6 week visits to Dr H's office are now over and we are due to go back in March for a check up to make sure her teeth are still good and the retainer still fits. After we left our last appointment of the day there and were in the car, I gave Finley a bag of ju-jubes and she was so excited to have gummy candy again. 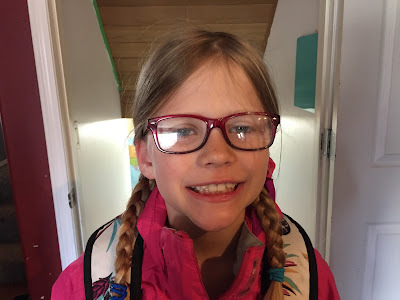 She also can't wait to eat popcorn and chips and meat with bones and liquorice and all the other fun stuff I wouldn't let her eat with her braces on haha. If anybody is looking for an orthodontist, I highly recommend Harfield Orthodontics over on Southport. They are fantastic in so many ways. The front line stuff are very friendly and accommodating and the ortho assistants (not sure of their correct name) are seriously so awesome. 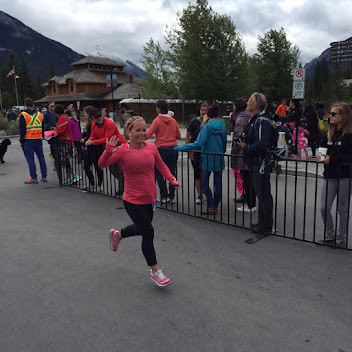 They do such a good job of keeping the kids calm and explain why they are doing what they are doing. Dr H is also really good at putting the kids at ease and talking to them about their interests and school and stuff. I didn't shop around to look for a better price and perhaps I should have. 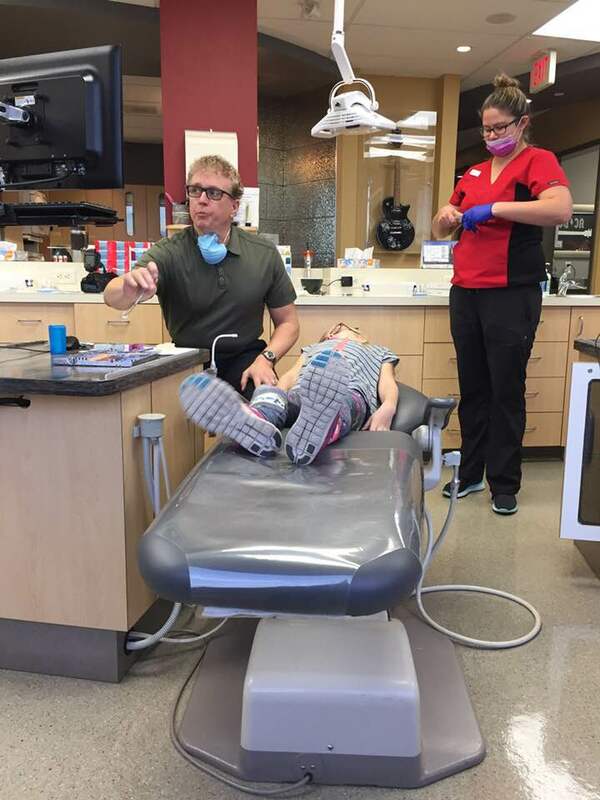 But at the end of the day, I was so comfortable with Dr H and his staff that I was happy with our choice to get all of Finley's work done. And should any problems arise with Penelope, you can bet it will be Dr H who will be seeing her.